alaTest has collected and analyzed 238 reviews of Lenovo A7-50 A3500. The average rating for this product is 4.2/5, compared to an average rating of 4.3/5 for other products in the same category for all reviews. Reviewers are impressed by the screen and size. The price and performance are also mentioned favorably, but comments about the storage and portability are mixed. We analyzed user and expert ratings, product age and more factors. Compared to other products in the same category the Lenovo A7-50 A3500 is awarded an overall alaScore™ of 85/100 = Very good quality. 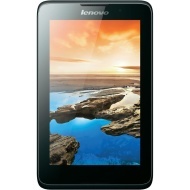 alaTest has collected and analyzed 34 user reviews of Lenovo A7-50 A3500 from Amazon.co.uk. The average user rating for this product is 4.0/5, compared to an average user rating of 4.3/5 for other products in the same category on Amazon.co.uk. People are impressed by the design and battery. The price and portability are also appreciated, whereas the reliability and screen get mixed opinions. My daughter has had this for 5 months and no problems as long as you are carefull on what apps are downloaded, we had a couple of minor problems after my daughter downloaded a couple of games but it was soon sorted. We would recommend this product. This tablet is a fantastic find,well made,sturdy, and great picture quality. The quality is high for the small price,it is quick to start up and everything works perfectly, would recommend! Great inexpensive product for my daughter who's 8. It's easy for her to use.